The almond is the edible kernel of the fruit of the sweet almond tree. It is a bright white fruti and wrapped in a reddish brown cover. It is consumed as dry fruit, fried and/or salted. Some well-known products, such as nougat and marzipan, are made of almonds. Almonds provide a great amount of energy, proteins, minerals, vitamins and fiber. In addition, most of the fats they contain are unsaturated and reduce the level of cholesterol in the blood. The almond is the edible kernel of the fruit of the sweet almond tree. It is a bright white fruit wrapped in a reddish brown cover. It is consumed as dry fruit, fried and/or salted. Many well-known products such as nougat and marzipan are made of almonds. 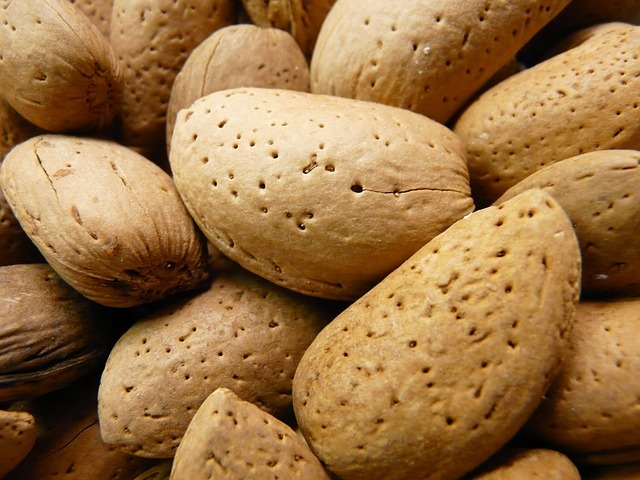 The almonds that we normally consume as dry fruit, fried and/or salted, are those of the sweet almond tree. They are used as an ingredient for confectionery produce such as nougat and marzipan, sugared almonds, pies, chocolate, ice creams and many dishes and sauces. The popular ‘garrapiñada" almond is covered with sugar, syrup or honey, and it is very tasty. Other products are also processed from the almond: flour, cream, horchata (tiger nut milk) and milk. Bitter almonds are not consumed as dry fruit, but from them we obtain oils or essences that are used as seasoning for many dishes. The almond is a dry fruit that supplies 576 and 626kcal/100g and is a good source of phosphorus, calcium and other minerals which are important for health, like iron. This fruit belongs to the same family of the plum and the peach, with which it has certain similarity when it has not been yet harvested. It is an oblong drupe with an edible seed or almond of sweet flavour and bright white colour when the reddish brown skin is removed. 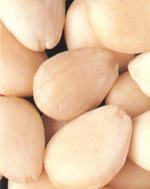 There are many varieties cultivated; however, sweet almonds can be classified in two groups, those with soft shell and those with hard shell. The bitter almonds used in the industry have an external similar appearance to the sweet ones. In Spain, the almond is harvested in autumn, around September, although it depends on the earliness of each variety, since at present there are early varieties like the Guara that are harvested in August. It is recommended to preserve them with shell in order to prevent rancidity. The almond tree is caducifolious, of not very vigorous habit and very beautiful when it blooms in winter. The almond comes from the tree of the family of the Rosaceae, Prunus communis or P. amigdalus species, that is usually known as almond tree. It may reach 5m of height, although it has not got a very vigorous habit. Caducifolious tree, with alternate leaves and a sawed, narrow and lengthy blade. The flowers make it a very ornamental tree. The flowering period depends on the variety; nevertheless, from mid January we see bloomed almond trees. In Spain, it is the first tree to bloom with edible fruit . The fruit is a drupe with a fleshy pericarp, of grayish green colour, that opens while it ripens, and a hard endocarp. Inside it we find the kernel or almond, which is the edible product.